Eagle Mountain's is home to three shopping centers. The largest of the three is the Porter's Crossing Town Center, featuring the Ridley's Market. Farther west, you'll find Parkway Crossroads along with Eagle Mountain's best restaurants. In northern Eagle Mountain, the Prairie Gate Business Park has a variety of local businesses and a beautiful wedding/event venue right along the golf course. Eagle Mountain's premiere shopping destination is a welcome addition to this growing city, bringing the first supermarket and hardware stores to the area along with many other smaller shops and services. 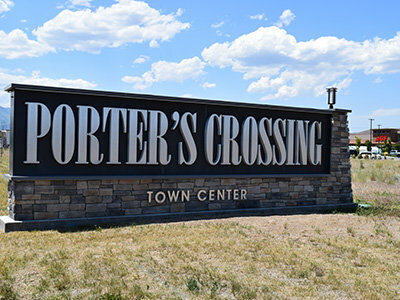 Located west of Porter's Crossing, the Parkway Crossroads Shopping Center is home to Eagle Mountain's best restaurants, a gas station, a dance studio, a child care facility and more. At the Prairie Gate Business Park, you'll find a gas station, an event/weddings venue "Garden Near the Green", a hair salon, and other businesses. There's also office space available for lease.